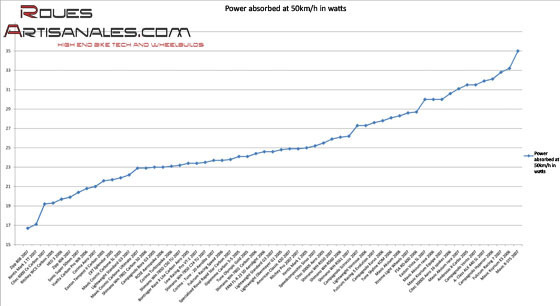 The windtunnel gives some useful insights into the test wheels’ aerodynamic performance. Drag measured in the wind tunnel is a reasonable indicator of the wake generated behind the wheel. The drag is an essential value. 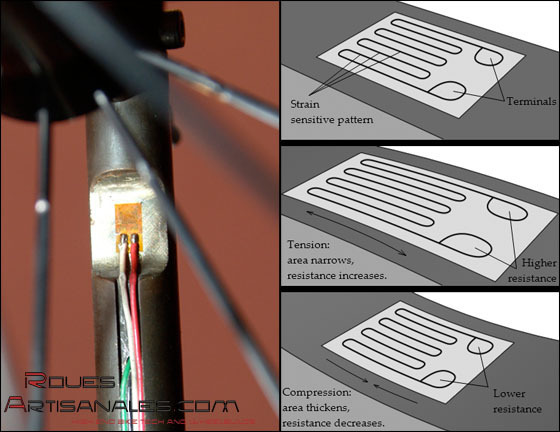 It is meaured by strain gauges bonded onto the inverted fork that holds the tested wheel. These gauges translate the fork deformation, caused by the aerodynamic resistance of the wheel, into electrical resistance which can be measured. Some other data are also captured by this setup including lateral forces and rotating momentum. However, we won’t analyse them as they don’t impact drag. The front wheel is fixed on the inverted fork and spins in the air passing through the wind tunnel at a known speed. The fan blades, generating the air flow, create pressure against the wheels. This pressure is recorded by several strain gauges and interpreted by software. 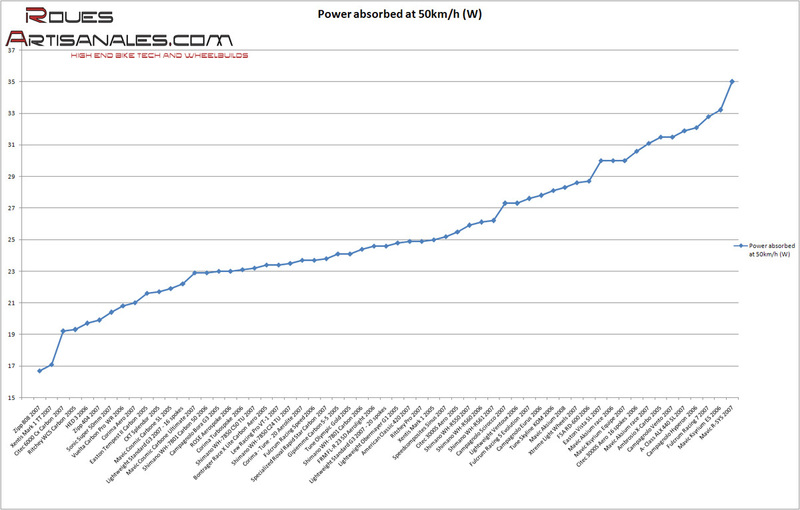 The weighted average force is then translated into watts absorbed at 50km/h. Which finally gives us a meaningful metric! The rear wheels are not tested since they enter in the wake of the frame and the legs of the rider. 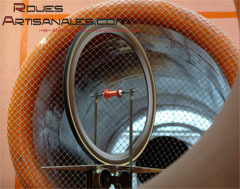 The tests are performed with 21mm tubulars and 23mm clinchers. The aero thin and bladed spokes’ advantage is easily understandable on the drawing on the left: their wake (drag) is very low compared to standard wider spokes. Xentis TT, HED, Sonic, Mavic Cosmic, Lightweight 16 spokes, Shimano 50mm, Campagnolo Bora, etc, have very good aerodynamics properties, although their rim is a simple triangle, or is slightly curved, as in the case of the Mavic CCU. If the air flow stalls quickly, which is particularly the case with flat rims, drag is important, meaning a high power loss at high speed. The Mavic Ksyrium or R-SYS are pretty bad on this point. Mixing flat rims and wide spokes, they behave as parachutes at high speeds. However, it is hard to criticize them since those aren’t wheels designed with aerodynamics in mind. This is the case too for the Campagnolo Hyperon, the Vento, the Eurus, the Mavic Aksium, etc. Please note two special cases. first look, to be designed for aerodynamics. Second, despite their 24 front spokes, the Speedcomposites do quite well. Here too, the mid deep rim (26mm) yields a low drag. The 20 spokes version should perform better too. For our custom handmade Corima/Tune 20 DT Aerolite spokes wheel, drag is also quite low- a little better than the Fulcrum Racing Speed. It would be interesting to test it with only 16 spokes like most « factory » wheels. 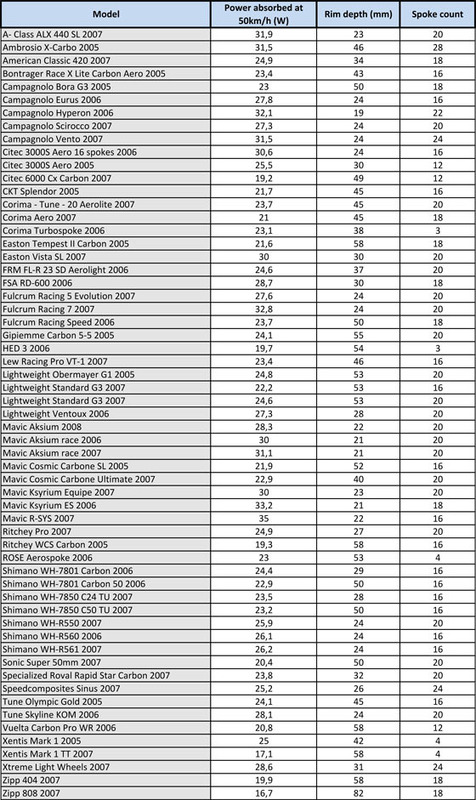 on flat stages and downhills, where speeds are highest. perfectly balanced and wide bracing angles, meaning a high lateral stiffness. Reducing the spoke count of the front wheel is not really a problem at all!